BARTHELONA AND PEDRO XIMENEZ RACING AT FLEMINGTON. 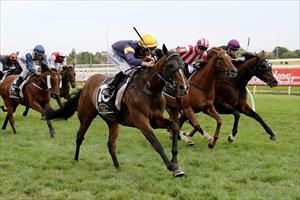 Barthelona and Pedro Ximenez represent us on our home track at Flemington on Saturday. Pedro Ximenez is the first to go in race two, the Voting Opens Monday for All-Star Mile Handicap over 2500m with Lachlan King to ride. “It’s a small field but he’s drawn nicely and that means he can take a forward position,” Moroney said. “He drew badly last time which meant he had to go back which cost him. Barthelona runs in the last race, the Victorian Owner Gold Card Handicap over 1200m with Lachlan King to ride from barrier six after scratchings. It is the second start this preparation for the five-year-old after finishing seventh first-up at Caulfield on January 5. “I know his record down the straight is not good but they have all been at 1100 metres and this is his first go at the 1200,” Moroney said. “It’s a big field so I’m hoping it is run truly.